This is Jodi (aka “JJ” – my old rock writing name) Adams who sent you the story of being on the New Race tour but being too shy to talk to Ron. One more sleep to go til the Manning Bar gig – couldn’t be more excited if I was a kid on the night before Christmas! Booked a ticket when they first went on sale and am also volunteering at the gig, probably doing merch desk as I am an old hand at it – done many charity gigs selling t’s, CDs etc. People are coming from all over Australia for this show…will be a wonderful reunion of folks who have known each other for decades (and loved Detroit music since their teens!). Hopefully there will also be a lot of wide-eyed young’uns who are about to (1) discover that people over 30 can play rock and roll with the best of them and (2) fall in love with that crazy kinda music that has sustained us through parenthood/family care responsibilites/sad losses/white hair/creaky knees etc etc! You couldn’t have asked for a better bunch of people to be playing, both in terms of their musicianship and also their quality as top grade human beings. Dave from the Gurus did a wonderful plug on our major Sydney AM radio show this morning and will undoubtedly plug it again tomorrow afternoon when he will be appearing on the same station beforehand. 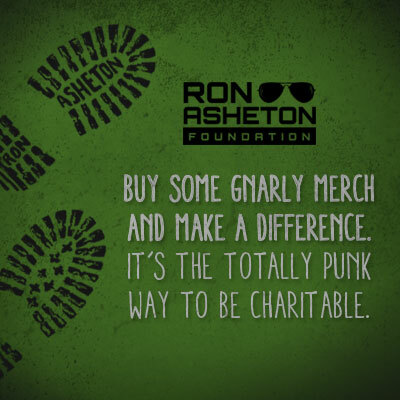 I hope we Aussies do the Foundation (and Ron) proud! And with Christmas shortly upon us, I (and many friends who will be attending) send best wishes and hugs to you, Ron’s famiy, and his friends…I know only too well how Christmas Day is never quite the same when you have lost someone dear. What a great night – five bands playing short sharp sets. I’ve never seen so many people at a concert for the first band in a 5-band program! The Four Stooges played five or six tracks from FunHouse (and did it well), the SC5 were a lot of fun (and are playing again at the Annandale in January), the New Christs were awesome (as one would expect) as were the Hoodoo Gurus – a highlight was their final song, a cover of “I Got a Right” with Rob Younger guesting on vocals, and The Visitors were brilliant. While they did mainly Visitors songs, their set included “Dirt” and, after a two song encore, came back a second time to do Birdman’s “Hand of Law”. What a finish to the night. The (very friendly) merchandise stall included the concert poster and a black t-shirt imprinted with a white version of the concert poster. Thanks to Deniz Tek and the organisers, and to the bands and staff for donating their time. I hope this entire show gets released on DVD. Thanks for the posting Fintán – I was one of the (very friendly) crew on the merch stall and had a wonderful time too (fortunately one can hear/see the bands from the stall). I am not sure if it was filmed – will try and find out what the story is – but would be great if it was!